Thursday - gone but still a scientist, SCIENCE! Every single one of your cells is covered in sugar molecules that can provide clues about how well the cell is doing. In particular I look at a type of blood cell called a lymphocyte, and how its sugar changes as it dies. The type of lymphocyte I am interested in is an important part of your immune system, that produces special proteins that help to destroy invading viruses and bacteria. As these cells die, they lose their outmost sugars, and that lets other cells of the immune system see that they are dying and removes them from our bodies. My work involves growing these cells in flasks, killing them, and then looking for the changes in the sugars using sugar-binding-proteins and a device called a flow cytometer. 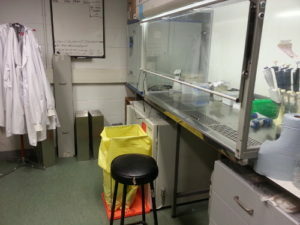 The sugar-binding proteins recognise different types of sugars on the cells surface, so by using specific proteins I can look for particular sugars. There’s a dye attached to the protein, so when it sticks to the cell we can detect that using either a microscope or my favourite machine, the flow cytometer. The flow cytometer is a device that allows you to pass thousands of cells, one by one, past a laser and detect if the protein-dye is attached. I collect thousands of cellsworth of information and try to interpret it. I’m from Cork, and I’ve been living in Dublin for six years. I’ve a BSc. in Biomedical Science, a Masters in Biomedical Diagnostics, and I started my PhD in 2011. In my spare time I do plenty of crochet, knitting and machine sewing. I use Linux on my laptop and do little bits of programming here and there. I’m an active member of TOG, the Dublin Hackerspace, where I turn up to the craftnight and help out on various projects such as the fabric cadaver and the twitter knitter. 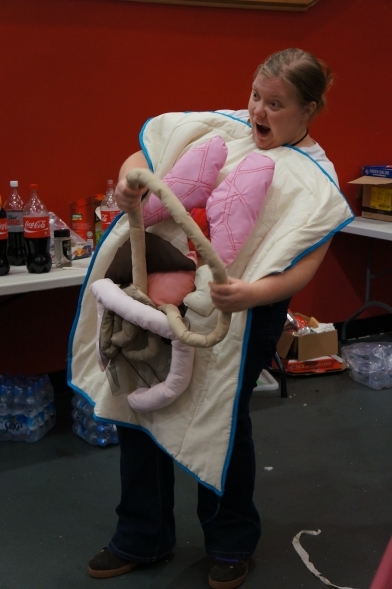 Me, wrestling the intestines of a prototype cadaver made at ScienceHackDay 2013. Most days I spent a chunk of time in front of my laptop, analysing data, looking for papers or trying to write up some of my work. I have to feed cells two to three times a week. 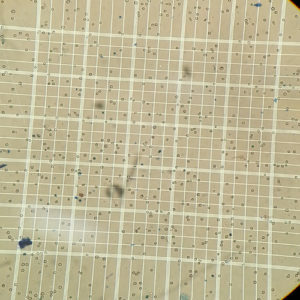 I have a flask of lymphocytes floating in media, and when they’ve used up the nutrients in the media and dropped out too much waste product, I need to put some of them in fresh media (and discard the rest that I don’t need). Two days prior to an experiment, I prepare my cells by causing them to die by apoptosis. I then stain my cells, and go down to the flow cytometer to measure them. Then I get to analyse more data! I also study my cells using western blots. I take the cells and add lots of detergent to break them down. 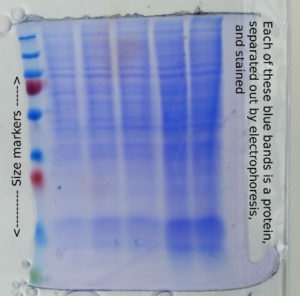 I put them at the top of a gel and use electricity to drag the individual proteins through the gel. The proteins separate by size and I can use more electricity to transfer them onto a membrane which I can then stain to identify some properties of the proteins. Some days I get to go to meetings or seminars. There’s a series of great standup/variety nights for scientists that get run in the UK, such as Science Showoff and Bright Club. I’d love to run one in Dublin, but with a super fancy theatrical venue. Science! For my leaving cert, I got to do physics, biology, chemistry AND applied maths. I was quite lucky, as a lot of people I’ve met since haven’t had the option on doing chemistry or physics, not to mind say all three science subjects! I spent a lot of time reading the science books in the library after I got bored of Nancy Drew and the Three Investigators. There was lots of books on the weather and space and dinosaurs, which I liked a lot. 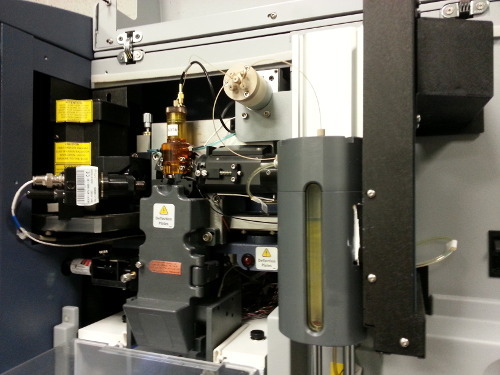 The inside of the flow cytometer. The DANGER ELECTRICITY door covers where cells can be sorted in droplets by giving each drop a charge and deflecting them with high voltage plates. This is a common way to look at the proteins in a cell. The cell is lysed (disolved), its proteins are then separated on a gel using electricity and then stained so we can see them. When you culture cells in a flask, you have ot make sure there aren’t too many. This is what I see when I count them when I feed them. Blue circles are dead cells, white circles are live cells. You count the number in the grid and multiply by the dilution factor to find out how many you have per mL.